Over the last days, we’ve learnt of at least 15 cases where people were not allowed to enter Poland for the period of UNFCCC conference. All of them were contributing to voicing civil society concerns, their demands, their solutions. Yet they were denied the possibility to come and speak. We’re calling the Polish government and the COP24 presidency to immediately stop policing to silence civil society voices and creating this atmosphere of intimidation. We’re asking the government to state clearly that they’re not going to arbitrarily arrest nor deport anyone coming to COP24 anymore. We’re also urging the UNFCCC to have clear and strict guidelines for the host country: It is unacceptable that this COP is being used as an opportunity for any government to shrink civil liberties and fundamental rights or threaten human rights of people, especially those who are already facing threats as human and environment right defenders. Special Rapporteur on the right to privacy. Over the last days, we’ve learnt of at least 15 cases where people were not allowed to enter Poland for the period of UNFCCC conference. 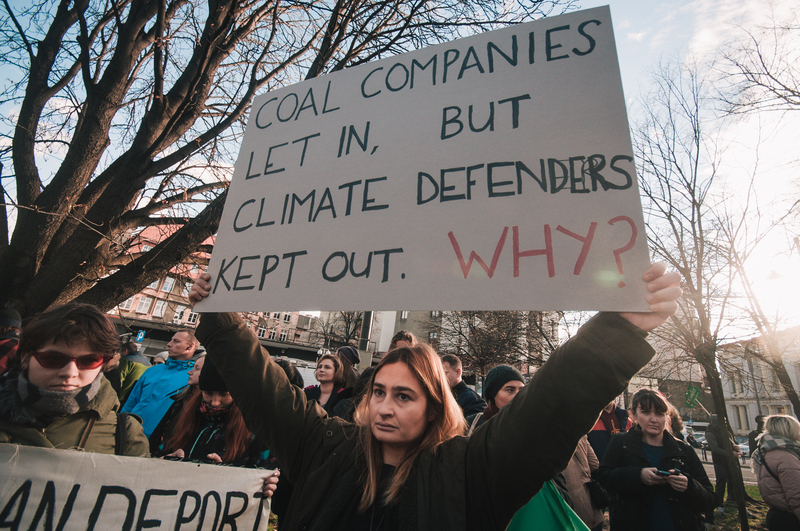 They were intending to join the COP - some of them were accredited by the UN, others were planning to organise registered events outside of the official UN negotiations around climate and grassroots action. All of them were contributing to voicing civil society concerns, their demands, their solutions. Yet they were denied the possibility to come and speak. This Saturday, two members of an Ukrainian group were arrested at their hotel, by the Polish police, and were detained for more than 10 hours for no reason. Later, three peaceful Polish protestors were detained after being arrested during the march. We’re calling the Polish government and the COP24 presidency to stop immediately policing to silence civil society voices, and creating this atmosphere of intimidation. We’re asking the government to state clearly that they’re not going to arbitrarily arrest nor deport anyone coming to attend COP24 anymore. We’re also urging the UNFCCC to have clear and strict guidelines to country-host: It is unacceptable that this COP is being used as an opportunity for any government to shrink civil liberties and fundamental rights or threaten human rights of people, especially those who are already facing threats as human and environment right defenders. We won’t let any government silence us. Thank you for adding your voice! Over the last days, we’ve learnt of at least 15 cases where people were not allowed to enter Poland for the period of UNFCCC conference. All of them were contributing to voicing civil society concerns, their demands, their solutions. Yet they were denied the possibility to come and speak. We’re calling the Polish government and the COP24 presidency to immediately stop policing to silence civil society voices and creating this atmosphere of intimidation.